Almost a year after arresting him, Turkey piled on new charges of “spying” and “insurgency” against American pastor Andrew Brunson on 24 August, demanding four consecutive life sentences in prison against the 23-year resident of Turkey. Jailed since his surprise detention without charges last October, Brunson was eventually accused of membership in an unnamed armed terrorist organisation. Turkish authorities later identified the unnamed group as the Islamic network of Fethullah Gülen, a Turkish cleric living in the US. Ankara has blamed Gülen’s movement for orchestrating the failed July 2016 military coup attempt against the Turkish government. Turkish authorities have since jailed more than 50,000 individuals suspected of Gülen links – including teachers, lawyers and journalists, holding them for months in pre-trial detention. Nearly 11 months after his arrest, the Presbyterian pastor and his lawyer continue to be denied access to the legal file of detailed charges and alleged evidence against him. According to a 24 August release by the state-run Anadolu news agency, investigations by the chief prosecutor’s office in the coastal city of Izmir submitted “new” evidence that Brunson had obtained confidential political and military information for espionage purposes, specifically to “overthrow” the Turkish Parliament and government and undermine the constitutional order of the state. Brunson flatly denied all the charges read out against him in a video conference call linking him to a judge of the Izmir Second Criminal Court from the maximum security prison in Izmir where the pastor has been held since late July. “I have never in my life met with a member of the Gülen movement,” he told the court. “I have never attended any of their meetings. I do not have a single link with FETO (the Fethullah Gülen Terrorist Organisation). I would never support a Muslim movement. Prisoner ‘swap’ on the table? The morning after Brunson’s unexpected conference call, Turkish President Recep Tayyip Erdoğan signed into law a new “state of emergency” decree, authorising him to approve the extradition of foreign nationals jailed in Turkey. The regulations include the option of “prisoner swaps” with individuals jailed in countries outside Turkey. According to an opinion piece published in the Washington Post in early July, the Turkish government has offered to free Brunson in exchange for the release of Reza Zarrab, a Turkish-Iranian dual citizen awaiting trial in the US since his arrest there in March 2016. The millionaire businessman faces charges of money laundering and bank fraud to evade international sanctions against Iran. Zarrab had been jailed for several months in Turkey as part of a major corruption scandal in December 2013 implicating several state ministers and businessmen with close ties to the Erdoğan government. He was eventually released. A second Turkish citizen, a banker also linked to the alleged violation of Iran sanctions, was arrested in the US in March this year, raising the possibility that the two Turkish defendants “could reveal at trial [in the US] new information implicating Erdoğan or his family in the sanctions-avoiding scheme,” the Post column observed. Lawyer Jay Sekulow of the American Center for Law and Justice advocacy group representing Brunson’s case confirmed to the Wall Street Journal that US and Turkish officials have discussed the possibility of swapping the pastor in a prisoner exchange. “The increased charges [against Brunson] are typical in these kinds of cases to up the ante,” Sekulow said. US President Donald Trump publicly requested Brunson’s release when he met with Erdoğan in Washington in May. Secretary of State Rex Tillerson again raised the jailed pastor’s case on 15 August, while commenting on Turkey’s issues outlined in the annual US International Religious Freedom report: “The US continues to advocate for the release of Pastor Andrew Brunson, who has been wrongfully imprisoned in Turkey,” he said. 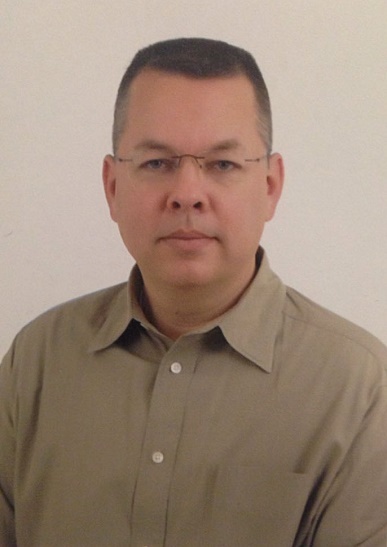 “Pastor Brunson has not been forgotten,” State Department spokeswoman Heather Nauert reiterated on the day of Brunson’s video conference call, when US Embassy officials visited him in prison. Now 49, Brunson led the Izmir Resurrection Church, a Protestant congregation of around 40 worshippers meeting in the city’s Alsancak district. He and his wife raised their three children in Turkey.